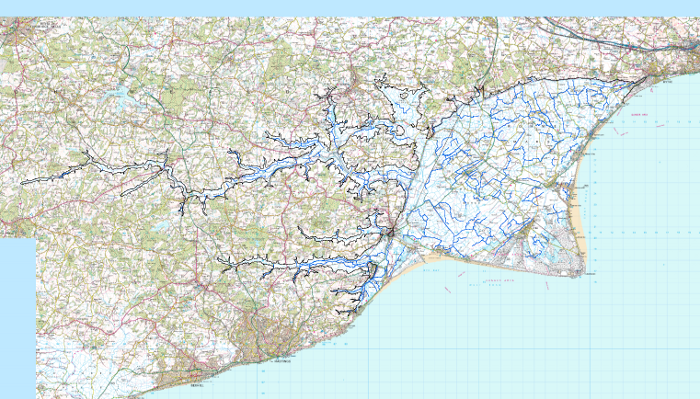 The area administered by the Internal Drainage Board covers over 33,000 ha (82,000 acres) in Kent and East Sussex and the catchment area (land which drains into the district), is 94,000 ha (232,000 acres). It is broadly situated between Hythe to the east, Fairlight to the south, Heathfield to the west and Tenterden to the north. It comprises of reclaimed coastal plain and upland valleys. There are 350km of Internal Drainage Board maintained watercourses within the district. Much of the marsh land is grade 1 arable land but the Board's area also covers the river valleys of the Rother, Brede, Tillingham and other tributaries. The majority of the marsh is below mean high tide level so without the protection of the sea wall the land would be under water much of the time. Land levels in Romney Marsh are about 2 to 3 metres above Ordnance Datum Newlyn (which is the mean sea level to which all levels in the country are related), however in the Dowels near Snargate the levels are about 0.3 metres. In Walland Marsh, the levels vary between 1 metre at Fairfield to about 5 metres at Lydd and Midley.